Living with fibromyalgia, symptoms, how to cope, diet and exercise. Spring is here, but there is still some winter in the air! Technically it is spring, although with the cold front that arrived in Texas yesterday, it doesn’t feel like it. (We even had a fire last night.) But as it has been lately, I am a day late and a dollar short…. I just chalk it up to my crazy life these days. In the months since posting my Fall Round-Up, a lot has changed for me. My mother had a stroke and my father entered hospice care, so there’s new stressors and changes going on with my family. I have been making monthly trips to Portland to help care for them. In between trips, I celebrated my 26th wedding anniversary by getting seven epidural steroid injections in my back for three bulging discs. (Ouch!) All the while dealing with family, fibromyalgia, a full-time job, and trying to keep up this blog. I do the best I can and I don’t beat myself up for what I can’t do. The holidays are long over and I am looking ahead to warmer days, spring flowers, and sunshine. But there is definitely still some winter in the air! In case you missed something, here is a round-up of my posts for the past few months – some on Fibromyalgia and others to inspire you to live your best life! Lately I have had a difficult time writing new blog posts. I am feeling overwhelmed, exhausted, had a flare-up of my fibromyalgia, and am just lacking the creative inspiration and desire to research and write a post. And that’s OK by me. We all face times of uncertainty in our lives. We all need to take a step back at times and do less. For this month, I am giving you 10 ways to unplug and recharge. And the great thing is this list applies to those with or without a chronic illness, so I hope this gives you some ideas to find time for YOU. I would prefer my “F” words include Fabulous, Fearless, and Fun. I was diagnosed with Fibromyalgia in 2000 and have said/thought many a curse word since that time. Fibromyalgia. Fibro. Fibro-flare. Flare. FMS. Fatigue. Fog. Frustration. Failure. All of these have become the other “F” words to me. I try to live by the power of positive thinking (hence, the name of my blog), but until you live a day in my shoes it may be hard to understand why even sometimes it is easier to smile and put on a happy face rather than truly answer the question of “How are you?” Because trust me, you don’t want to hear about how I am tired, hurt all over, didn’t sleep last night, and oftentimes feel like a failure because I can’t do the things I want to do. Fibromyalgia is a complex, chronic pain disorder that causes widespread pain and tenderness. I often refer to the fact that I have fibromyalgia in my posts, but many of you might have found your way here through some of my other musings, so I thought I should introduce some of you to this condition. 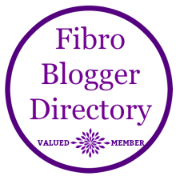 Author PhotobaughPosted on February 20, 2019 April 13, 2019 Categories FibromyalgiaTags #FibromyalgiaAwareness, #ShineALightOnFibro, #ShineforFibro, Fibro, fibro blogger, fibro-warrior, FibroFlare, Fibromyalgia, Fibromyalgia Warrior, Flare, Spoonie, Spoonies11 Comments on What Is Fibromyalgia? This post from Barbara at Back Pain Blog came at the right time for me and I wanted to share. I just had Epidural Steroid Injections in my back this week for three bulging discs, sciatica, and radicular neuropathy in both feet, and this was a timely reminder. Enjoy! One simple lifestyle change that can significantly reduce your back pain is a guest post from Tavistock Clinic in Crawley. None of us are strangers to back pain. It’s the leading cause of disabilityin the UK. In addition, 80% of the populationexperience back pain at one stage or another in their life and it is one of the most common causes for absence days at work. Back pain is often a mystery. The reason being, it can be caused by such a wide variety of reasons. You may twist your back whilst reaching something on the floor, and the pain is caused by overstretching the muscle. You may have had a car accident, where the pain is caused due to the physical impact to the muscle. You may even be getting back pain from emotional trauma or certain foodsthat you react to unknowingly. Bloating, gas pain, and cramps are just a few of the symptoms that lead you to seek fast relief.